The Maine Fallen Heroes Foundation is headed back to where it all started 10 years ago! 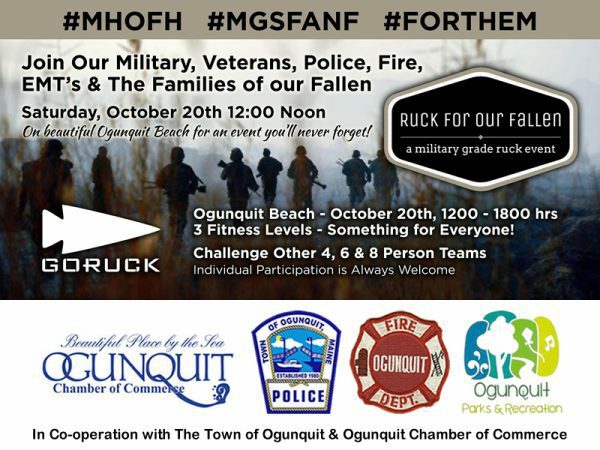 Join our military, veterans, police, fire, EMT’s, and the families of our fallen on Saturday, October 20th at Noon on beautiful Ogunquit Beach for an event you’ll never forget! This incredible event takes place during the Ogunguit Chamber of Commerce’s 15th Annual OgunquitFest Weekend so they’ll be thousands on hand to watch! There will be (3) fitness levels so there is something for everyone to enjoy: Slick (Light), Tactical (not so easy), Heavy (where the fun starts!) Get your team together & challenge others! We’re expecting people from near and far for this first of its kind annual event for our fallen heroes & their families.